As a part of the free guitar lessons at learn-to-play-rock-guitar.com, I want you to have access to stuff you may not even be thinking about when it comes to rock guitars. We’ve talked about guitar strings for playability and tone, but let’s go deeper than that. Something that’s not talked about much in free guitar lessons, but is very important to your sound, is the neck and body wood(s) of your guitar. Each variety of wood has unique properties that contribute to guitar tone. The wood commonly used in guitar manufacturing is called tonewood by guitar luthiers (stringed instrument makers) and manufacturers, and different woods have different tonal qualities. The kind of tone (sound) you get out of your guitar is directly affected by the type of wood used to make your guitar. From deep mellow sounds to "tinny" or "twangy", you were probably drawn to your guitar (or one you want to buy) because of the way that guitar sounds. To add even more complexity, guitar bodies are often built with two (or more) different woods. Usually one wood will be used on the top of the guitar for both the tonal quality and visual appearance (like a flamed or spalted maple top). Then for the back wood, a different variety (like mahogany) will be used to balance out the tone of the guitar. Alder - the traditional wood used for Fender Stratocaster bodies. Ash - Fender Telecasters are made of Ash because of its brighter tone. Basswood - primarily used in Asian-made, inexpensive guitars. Korina - historically known and used for the Gibson Explorer and Flying V.
Mahogany - The Gibson SG and Les Paul Junior bodies are made from solid mahogany. Maple - used a lot as a laminate because of its grain patterns. Maple & Mahogany - many guitars are made out of this combo, with a maple top and mahogany back to balance tone. Poplar - another tonewood used in many Asian-made affordable guitars. Rosewood - more used in acoustic guitars and fingerboards. Walnut - a heavy, dark wood, sometimes used for accent like the stringers (strips on either side of the neck-through section) on a BC Rich neck-through guitar. 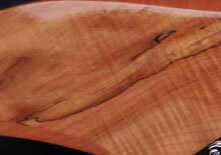 Exotics - woods like koa and bubinga used in more custom guitars for interesting grain patterns. Mahogany & Ebony - combined for mahogany’s stability and ebony's sustain. Mahogany & Rosewood - this is the most common neck and fingerboard combination. Maple - used for necks that require bright highs. Mahogany & Pau Ferro - gives tones in between ebony and rosewood. Maple & Rosewood - the rosewood and maple combo mellows the maple neck’s highs a bit. As far as application, for rock music the maple and mahogany body combo tends to be the norm. This combo tends to sound good when overdriven (distorted) because of a nice mix of maples hardness for sustain and mahogany's warmer tones. You'll see more country stars using adler and ash body guitars (like Fenders) to get the "twangier" sound coming from these hard woods. At some point in the future this information can be useful if you decide you want to build your own guitar. You’ll be able to decide on what woods you want to use. For right now, hopefully it helps you understand the importance of wood choices in guitar manufacturing and application. You can get started here for more free guitar lessons.